Now that I have all the plugs for gravestmor out of the way, and with all the I thought I would run through a couple of buildings that are made to put art in them that may be considered by some as pretty good. Today, some of the classics. Later, some newer ones. The Kimbell Art Museum, 1966, Fort Worth Texas, by Louis Kahn. The Kimbell set the standard for naturally lit galleries and displays a structural athleticism with concrete beams spanning 40m. 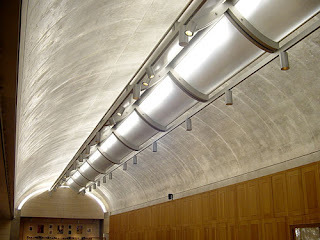 The building is made up a series of linear barrel vaults comprising an entry portico and the gallery spaces. Light enters the building at the top of the vault and is bounced off a series of perforated aluminium reflectors onto the underside of the concrete vaults. The reflected, evenly distributed lights allows the gallery to be daylit without glare or any visible light sources. This is something of an archi-fetishists dreamscape. It is the meticulous and highly particular conversion of 12th Century castle on the edge of Verona’s old city and houses a collection of 11-17th Century artworks. Each room of the museum has been carefully restored and re with a vigour that ought to make the Heritage boffins in Australia gallantly protecting their 80 year old ‘heritage’ with such “don’t touch that! Its old!” nonsense ashamed. Here, holes have been cut in walls, sections of roofing have been removed, floors have been re-laid in concrete pavers and so on. However each move that Scarpa made serves to highlight a characteristic of the building or to show off an artwork in a particular way. The artwork – in particular the sculptures – are each carefully displayed to strengthen the place of the artwork in the museum. 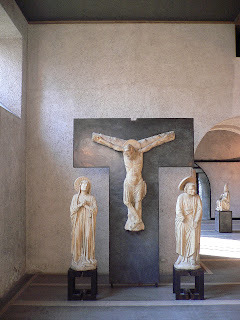 Sculptures are set on ornate pedestals, a crucifixion is placed against a brass cross with an inverted top, and paintings hang suspended from brass rods or sit on intricate, mechanical easels. 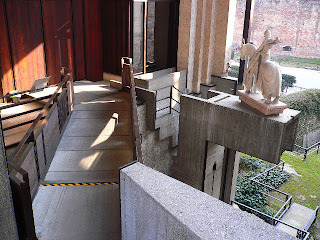 The most notable example of the building being modelled to accommodate the galleries collection is the equestrian stature of Cangrande which sits out on a cantilevered beam looking over the castle’s courtyard, the strictly controlled movement through the gallery dictating that the sculpture is viewed from every possible angle. 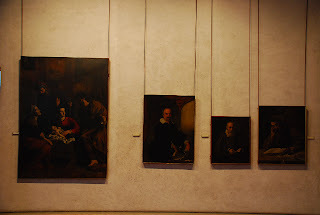 This is not a gallery with a rotating collection and I have no idea what the museum does if it acquires a new piece. Convert a new room? 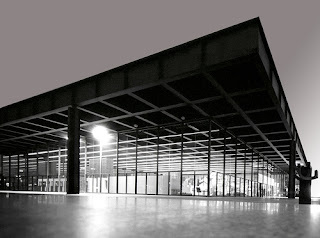 New National Gallery, 1968, Berlin by Mies van der Rohe. This is the possibly the most evil gallery in, like, forever. Mies van der Rohe’s was an architect whose career saw many innovations in unrelenting modernism (mother fucka exploded the wall), a great number of cigars consumed and this was his final work. It is essentially an enormous steel pavilion on a stone podium. Much of the gallery space is located in the stone podium, the pavilion over generally dedicated to ticket sales and the occasional special exhibition. This is perhaps the ultimate architect’s art gallery, where the pesky pictures and figurines are kept in the basement and the gallery is free to sing the praises of the architect. But then, it is an extraordinary building. The whole roof curves upwards slightly, like classical temples do, to correct the optical impression of a sagging roof. The monumental black steel structure sits perched on only eight elegant cruciform columns and spans 65m. So who cares if the art is in the basement? Photo by Flickr user Manuela Siener.